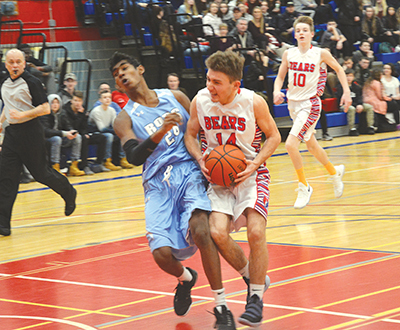 The Orangeville District Secondary School Bears continue to turn out a good performance on the court this season and are currently in second place in the District 10 standings. The squad hosted John F. Ross CVI on Tuesday, January 16, in a game that pitted the two top teams in the District. It was a buy-out game for ODSS students so the bleachers will filled with support for the Bears. The Ross team came to Wednesday’s game as an undefeated squad. The two teams have met once this season – back on December 7, – and in that game the Guelph team came out on top with a 71-54 win. The Bears came to the court with a second place standing and an 8-2 record. The ODSS team hit the court with a solid offensive effort that saw a lot of accuracy taking the hoop shots and good defensive posturing to keep the Ross team to the outside. At the end of the first half the Bears had managed a 38-27 lead. By the end of the third quarter the Bears had extended that lead to 15 points finishing the quarter with a 56-41 tally on the scoreboard. The fourth quarter showed why Ross is a leading team in the District when they returned full force in a huge effort to get back into the game. The Ross squad managed to close the scoring gap with some good offensive play late in the game. With two and a-half minutes remaining they had reduced the score to a six point difference. The Bears fought back and hit the hoop for two more in the final minute to win the game 72-67. The fact that Ross made a comeback late in the game gave the Bears something to think about when it comes to future efforts. The Bears went up against Our Lady of Lourdes on Monday, January 15, and came up short with three point loss in a 73-70 game. They rallied on January 18, when they finished with a 43-31 win over St. James for their ninth win of the season. The Bears will return to their home court on Tuesday, February 6, when they will host Guelph Collegiate. Game time is 3:45 p.m.